Years ago, I made a rather silly claim that when I became an old woman I would spend my days picking up trash and pointing out the moon to people. I could see myself perfectly, doing exactly that. This January, while not yet being an old woman, I set an intention to walk in nature every day and to pick up trash during my walks. There would be plenty of moon sightings as well, with the month bookended by two full moons and even an eclipse. It was a small goal, but quite meaningful to me. 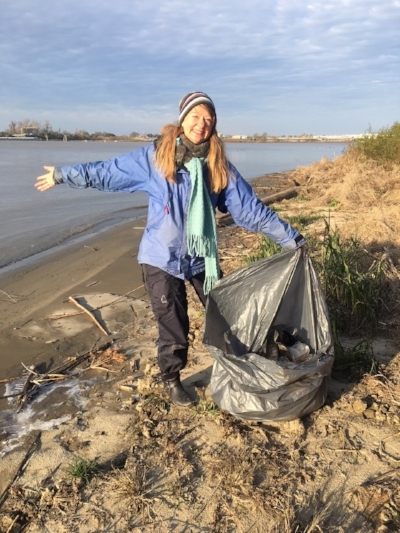 I invited others to join me and we picked up a lot of litter, especially along the Mississippi River. Litter is like laundry or dishes - there is always more to do, so you have to approach it with that mindset. Something you cleaned up yesterday will require a clean up again today. It's wonderful spiritual work for me, and a great meditation into finding compassion both for myself and for all the people leaving the litter behind. And for questioning how we live today and how we might live more in alignment with what we believe. Do you feel that the world is at a turning point? That what we seemed to be able to get away with in the past is no longer working? That what we could turn away from before, no longer feels ok to ignore? I have had the word "deepening" percolating throughout my intentions and journal writings for the past couple of years, and as the new year approached, I was excited to see the word in the musings of others in my circles. We are feeling the pull towards Deepening. What would that mean, to deepen? There's so much skimming on the surface, so much to attend to, so many distractions and requests for our eyes and ears. What does it look like to deepen? What would that mean for you? Would it mean slowing down? Letting go of some things to focus more intently on others? Setting down the technology? Taking a stand when you're usually quiet? Two mornings ago, I woke up with another word floating in my dreaming/waking state: reverence. Reverence. How could I frame my life around reverence? I revere wild nature, freedom, balance, sustainability, kindness, peace. How am I living life to show that these are the things I revere? What do you revere? Take a moment to consider. We can find reverence as we pick up the trash - whether that's a metaphor, or a genuine action we're taking in the world.